The elusive beauty of mermaids has been a source of fantasy for kids and investigation for adults. The delicate scallop patterns on a mermaid’s tail and the long flowy locks of this underwater being are parts of the sum of the mermaid fantasy. Mermaids are puzzling to discover but don’t fret. We might have to substitute that make-believe and depict them in digital illustrations and in this case, invitation cards. If your child adores this elusive persona, you may have more than a peek at our list of aesthetically pleasing mermaid invitation cards. All are available in a downloadable format and while you’re here, you may also view on more printable party invitations that you can use. 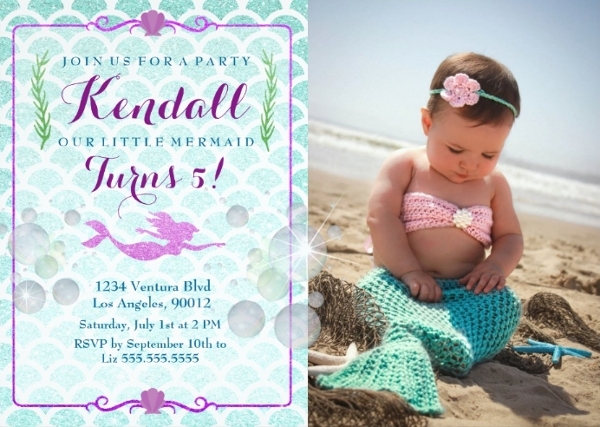 If you are looking for a photographic style of invitation card, the Mermaid Birthday Party Invitation is a great catch. It displays a classic scallop pattern with glitters filled inside and is trimmed with a touch of violet for its borders. The design incorporates underwater elements such as shells, seaweeds, bubbles with a touch of glimmer and most importantly a silhouette of the elusive mermaid. In relation to the previous catch, we also have another beautiful free party Invitation on our list. The Mermaid Party Invitation Template showcases miniature scallop patterns inside of a mermaid tail shape and most of the elements are dusted with faux glitter to bedazzle any potential guest. 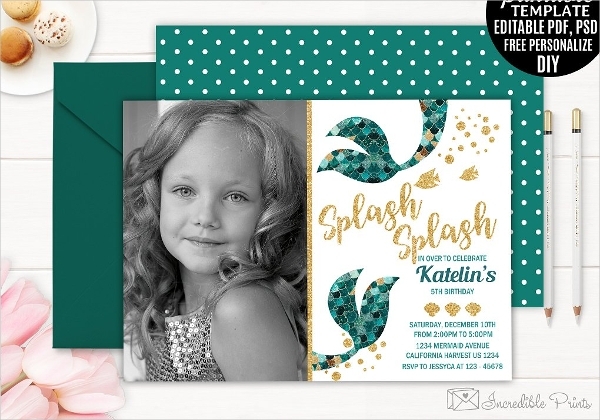 To contrast the sparkles in the mermaid card design, white polka dots placed on a cool blue-green color to create a cohesive theme. 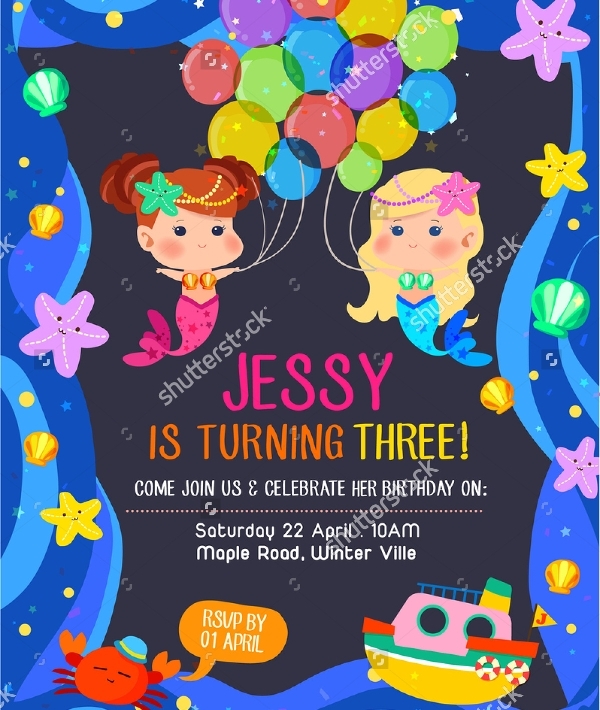 For a colorful and festive mermaid inspired card, the Mermaid Theme Party Invitation combines receding colors for the background and advancing colors such as yellow, red, orange and its shades as the underwater elements. If you want a combination of the mermaid fantasy and navy, the Free Printable Mermaid Invitation is your go-to. It has a realistic touch to its design and portrayal of a classic Disney princess, Ariel and her sidekick, Sebastian. The seamless mix of the warm and cool colors showcases the beauty of the sea. 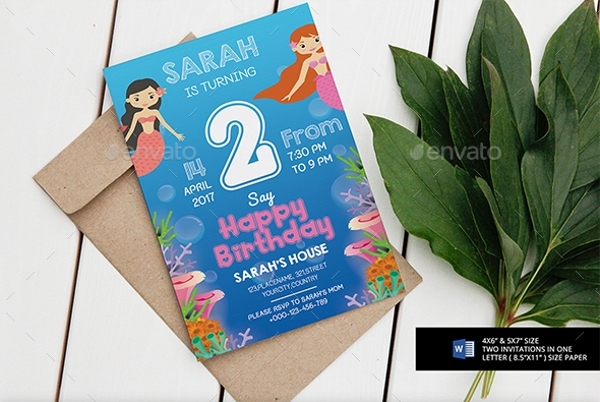 The PSD Mermaid Party Invitation is dominantly using receding colors of blue, violet and its shades to display an underwater theme. This sample comes along with easily customizable and is print ready. 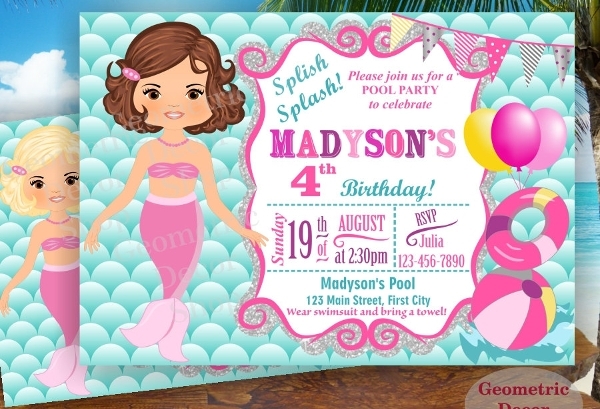 If you want a digitally illustrated mermaid fantasy, the Mermaid Pool Party Invitation is a great choice. It has a classic scaled pattern for the background and popped up with a bright pink and glitter border. These printable invitation incorporates a circus layout and is using a dominant use of blue and pink with touches of yellow and gray. This next example uses realistic water textures and seaweeds but is then paired with a lone illustration of a mermaid. 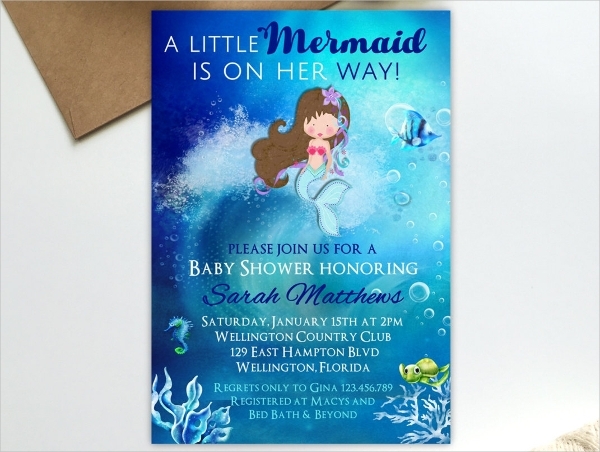 The Baby Shower Mermaid Party Invitation is a formal take on invitation cards. The layout incorporates both serif and sans serif fonts and is balanced with a hand-written font. 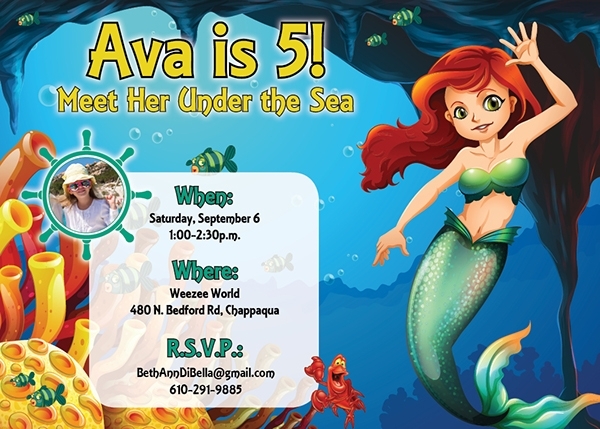 Make sure to have a proofread or run through before handing out your mermaid theme invitation cards. Do not overlook the technical elements such as the event details and adjustments to the design. If your mermaid invitation card is compatible with PSD or in an EPS, and AI file format, make sure to save it as CMYK before printing to retain the colors you assigned for the cards.